Red stones and mountains, lots of different water hazards combined with the well maintained green areas, that is Red Mountain, one of the best golf courses in Thailand. The designer of this pearl of golf was Jon Morrow a very close friend of mine. Through the Gary Player Group, Jon was selected by myself to be the head golf instructor for the Gary Player Golf Academy in Phuket /Thailand. Combining very creative golf with an artistic touch, Jon later moved into the art of golf course design. Red Mountain became Jon`s masterpiece. Personally I have never seen a golf course where nature has been preserved so well and each golf hole becomes an experience of pure pleasure. Unfortunately the golf team I was due to play with cancelled at the last minute. At first I was disappointed but decided to play the course anyway. It turned out that this decision was a very good one. 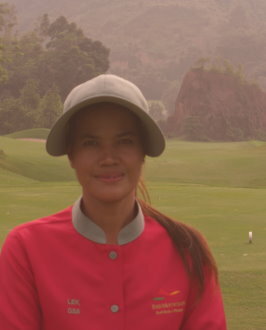 Before the game I asked Lek whether she could do the filming on the course? “No problem” was her answer and after a quick introduction on how to use the camera off we went. The first hole is very picturesque and inspired by the beauty of this hole and my special caddy I hit a great drive in the middle of the fairway with only a 9 iron left to the hole. I got the approach shot close to the flag and with one putt I finished with the first birdie. After a couple of more birdies I was promoted by Lek as the Superstar and with this new image the rest of the day was one of the best I ever had on a golf course. 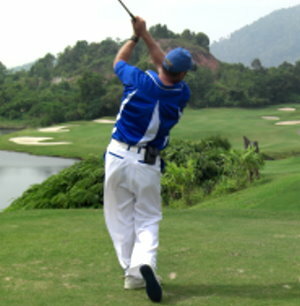 With my best shots being caught on film and the very relaxed atmosphere I played a great round of golf. 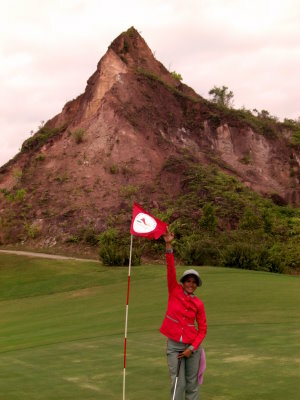 Red Mountain is a must for golfers who like the beauty of nature. 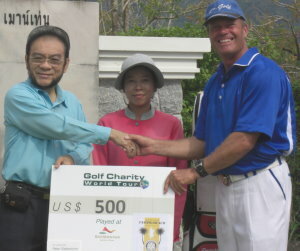 After the game I gave the US $ 500 donated from Peter Siebenborn to Khun Boon, the representative of the Phuket Rotary Club. The money will be part of the Club`s charity contribution for the flood victims in and around Bangkok.